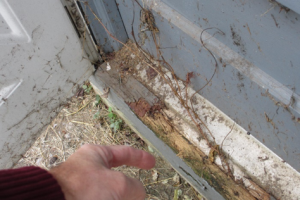 A Wood Destroying Insect inspection is always recommended when purchasing a home or investment property. Most attorneys and mortgage companies are requiring a NPMA-33 Wood Destroying Insect inspection form as part of standard procedure. 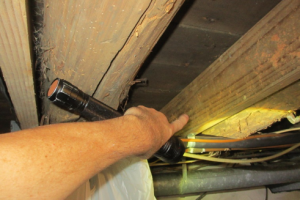 It is always a wise decision to have this type of inspection done when buying a home or investment property. Termites are the most common of the wood destroying insects, but other insects can also affect and damage a property, including carpenter bees, carpenter ants, and powder post beetles. 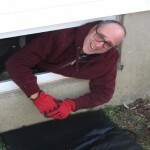 Jersey Strong Home Inspection checks for any damage, current activity, past activity, or previous treatment. 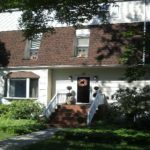 Our process includes evaluation of the exterior areas of the house, interior areas, attic, basement area and any visible and accessible sections of the property. What Damage Can Insects Cause to Your Home? If the impact of wood destroying insects is minor often it can be remedied through a standard treatment by a licensed exterminator, along with repairs by a licensed contractor. Some examples are; minor damage to a deck, base of a door frame, around the base of the garage door, or entry door threshold. 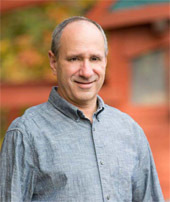 In other cases, the damage can be extensive and require damaged wood, supports or beams to be replaced/repaired as it can impact the structure or stability of the house. 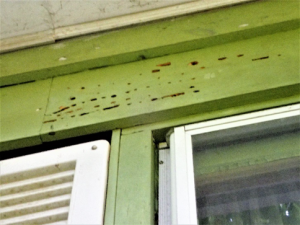 Several examples of damage that are commonly found from our home inspections/wood destroying insect inspections in Monmouth and Middlesex counties in NJ follow. 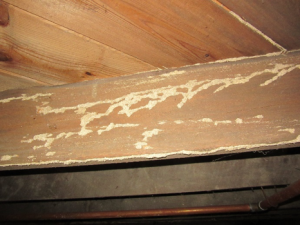 Termite damage to floor joists in the basement in Long Branch, NJ. It appears that some repairs may have been done. The house was never treated so activity may still exist. 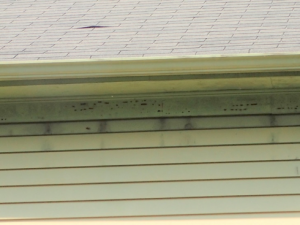 Carpenter Bee damage to the wood trim and fascia boards in Red Bank, NJ. 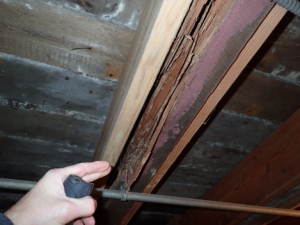 Typical repair requires replacement of the wood, along with treatment by a licensed exterminator. This is a main support beam along with flooring joist in a South River, NJ multifamily basement. Damage was extensive, and the wood rotted. 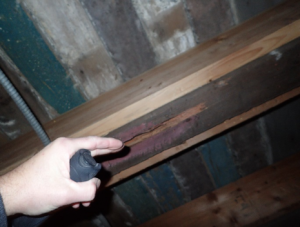 This may required complete repair or replacement to prevent the beams and joists from failing. 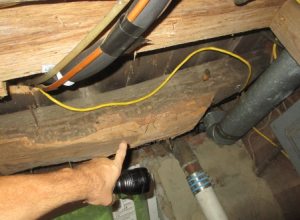 The house in Freehold, NJ had termite damage around the exterior door frame and threshold wood. This will require damage repair to this area along with a treatment to the house. The beams in this Morganville, NJ farmhouse were built with timber that may have been from a local woods or field. 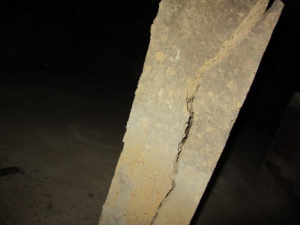 Many of the beams were severely damaged from termites. Not all wood destroying insect activity is always as obvious as shown in these photographs. On some of our inspections, the entry is hidden or just staining remains. 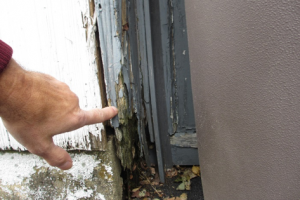 Therefore Jersey Strong Home Inspection highly recommends a complete Wood Destroying Insect inspection with your home or property inspection.